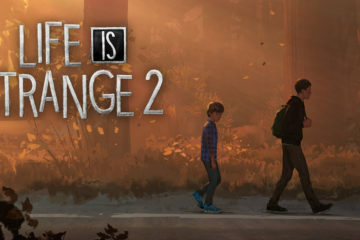 Note: This is part 2 of a 6-part review that will cover all 5 episodes of Life Is Strange 2 as they are released and conclude with final comments on the full game. THIS REVIEW SERIES CONTAINS SPOILERS! Read the review of Life Is Strange 2: Episode 1, Roads. Waiting for new Life is Strange episodes is like having an unscratchable itch. Whilst it’s only been 3(ish) months since Roads, it feels like double the time has passed; really just more evidence that I’ve spoiled by binge culture. Rules takes a step back from the politically-charged themes of Roads, and a few months have passed. We pick up with Sean and Daniel Diaz who still on the run. Holed up in an abandoned cabin in the woods the boys have created both routine and fun for themselves. Daniel’s telekinetic powers (teased in Roads) are developing. Sean coaches the younger Daniel in moving different objects by encouraging him to test his powers over longer distances and with heavier things. …The boys’ adorable puppy, Mushroom, is attacked and killed by a mountain lion. The set up was obvious; Mushroom scratching at the door to go outside. It felt out of place and immediately sinister. While we don’t see the killing of the puppy, we do see the bloody evidence of what went down. I’ll look deeper at this odd story choice in a lil bit. The next stop for Sean and Daniel is the home of Claire and Stephen Reynolds, the brothers’ estranged (maternal) grandparents. The couple take the Sean and Daniel into their home despite not having had a relationship with the boys since their daughter, Karen left the Diaz family not long after Daniel’s birth. The Reynolds’ home gives the boys their first true respite since being on the run. At this point it’s nice to see them welcomed and cared for. Having avoided the Rules trailer, the reintroduction of Captain Spirit’s Chris and Charles as the Reynold’s next-door neighbours was a surprise! The scenes with Chris are heart-warming but too brief. 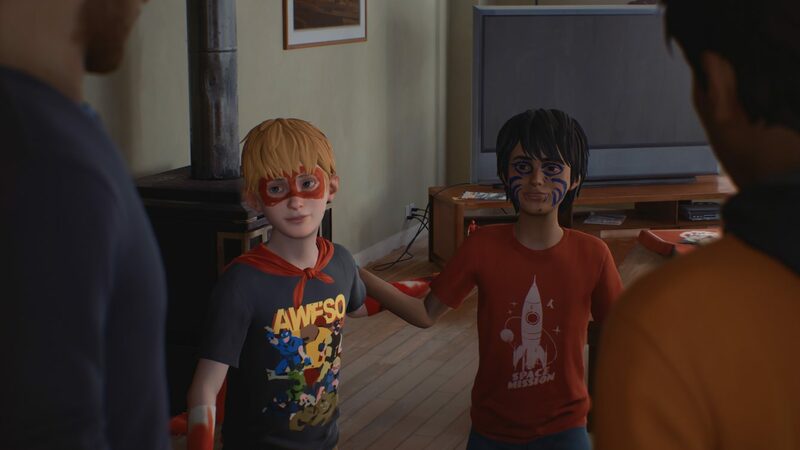 Despite its short length Captain Spirit was a compelling demo that encouraged players to form an emotional attachment to Chris. It doesn’t seem like Life Is Strange 2 will be expanding much more on Chris’s story beyond this episode. His role in Rules is as as friend to Daniel, who shares his love of superheroes and comic books. Aside from a lovely trip Christmas tree shopping, sadly we don’t spend much time with Chris and his father. Towards the chapters’ end another surprise comes in the form of a revelation about Karen’s whereabouts. After being forbidden by Claire to enter Karen’s old room, the boys defy the rules and break in. They learn what they can about their mother by exploring old poetry, pictures and music. Sean finds a letter written by Karen in the room that implies she might become a bigger part of this story then we thought. As this story was bound to have happen, the police soon catch up with Sean and Daniel at the Reynolds’. Just as we longed for the warmth of the Diaz household in Roads, we will no doubt also long for the cosiness of the Reynold’s home. The boys are once more forced to make a run for it as Rules ends. 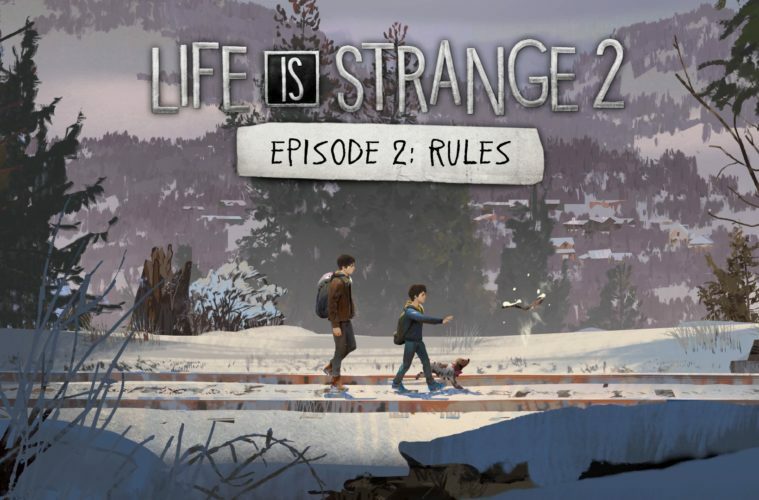 After the intense events of Roads, Rules feels somewhat like a down beat in the narrative of Life is Strange as the characters (and player!) finally receive some safety and comfort. More spectacular landscapes, soundscapes and performances are delivered as the story continues to bounce players between stages of comfort/discomfort and safety/risk. For some, Rules might play as uneventful or unexciting with the ‘downtime’ offered in this chapter not able to have the full effect after a 3 month break between episodes. I think that when the entire story gets released, this chapter and the calmness it provides will see greater appreciation. The death of Mushroom, on the other hand, is an element of the story I don’t think any time or context will offer reprieve for. To be clear, it’s not the event in and of itself that I find troublesome; it’s just the seeming lack of reason for that specific writing choice. Yes, as already noted this story is about putting people on an emotional roller coaster. Fine. I wonder if the idea was to have an extremely emotional and traumatising scene to balance out the very calm mood throughout the rest of the chapter? Did they just want to gut punch players with back into the sombre mood of the story? Did they realise the impracticality of giving these characters a dog in the first place and use this as a way to remove Mushroom from the story? I don’t know! It bothers me. While the scene does have a practical application – discovering how emotions impact Daniel’s use of his powers – it still feels like a cheap shot. Life Is Strange has always told emotional, well-crafted stories that have tremendous impact, and they’ve always managed to do so without resorting to doesthedogdie.com-esque plot devices. I also feel as though the lesson Sean and Daniel learns in this scene could have been just as easily explored in scenes with Chris and Charles. This would have allowed for more exposition for these characters and their story, which is sadly lacking. In coming episodes it will be interesting to see how Daniel’s powers continue to develop, and if they begin to play more of a prominent role in LiS2‘s gameplay aspect. So far telekinesis has featured more as a plot point; an understandable choice by DONTNOD considering any insight or narrative-based-reasoning was completely absent when it came to Max’s rewind ability in LiS1. It’s a solid step forward. I’m also hoping that the choices you make as Sean will become more impactful and offer less linear outcomes. Twice in Rules a scenario presented as a choice, but ultimately they result in the same event and outcome. While other choices (e.g. whether or not to let Daniel swear) seem superficial, I’m thinking the pay-off for each choice may have less to do with what happens immediately after, and more to do with the story; specifically Daniel’s path on the long term. This after all, is a story about an older brother stepping into the role of primary caregiver to a younger sibling. So regardless of the immediate outcome, the choices Sean makes impact and influence Daniel. If the brothers become separated at any point during the narrative, then I believe that the independent actions Daniel will take will be of direct consequence of all Sean’s choices up until that point. The previously mentioned ‘swearing choice’ gives an immediate example of Sean’s influence and how his choices alter the actions Daniel takes. If the chaos-to-calmness narrative pattern continues in the next episode, we can expect chapter 3 to twist us into knots! Although… the post-credit teaser for the next instalment shows the brothers strolling through a grow house. So the next chapter, or at least Sean’s part in it, might turn out to be very chill indeed.